So what are the best-weighted vests for running? Considering the many options that you have, here are some of the best options. Running is a great way for the body to burn calories. However, what most runners fear is that they have developed muscle endurance and muscle memory making running efficient and therefore burning fewer calories. If you are running for fitness, one of the best ways to burn extra calories is by running with a weighted vest. The weighted running vest can is a great investment especially if you want to be challenged as you run. BEST VALUE FOR MONEY – SKLZ Weighted Vest: Though the products that we will mention are all great options, SKLZ Weighted Vest offers the best bang for your buck. Not only does it offer equal distribution in your entire body that can prevent muscle imbalance, it is also made of the material that is waterproof. This means that you can run outdoors and not worry about the weather or if you are already sweating too much. RunMax Weighted Vest is a top of the line workout tool preferred by many athletes and people who simply want to get fit. It offers users the freedom to choose how much weight they want to place on their weighted vest. This is a perfect for those who plan on running, doing kettlebells, or even those who simply want to increase the difficulty of their pull-ups. The design of the RunMax Weighted Vest is quite comfortable regardless if you are into cross training or even for running. Unlike other products that can make you feel uncomfortable during training, this particular weighted vest gives you the ultimate freedom to move. The vest is also a one-size fits most. And because of this, you can easily use it regardless of your size. Well, on most occasions, it fits the majority of body types. In terms of functionality, you can place as much as 140 pounds on your weighted vest. This means that it has been made not only for the average person but even for athletes who want to maximize the resistance that they can place on their weighted vest. It has solid fabric material and high-quality craftsmanship that can withstand the weights that you plan on using this vest. 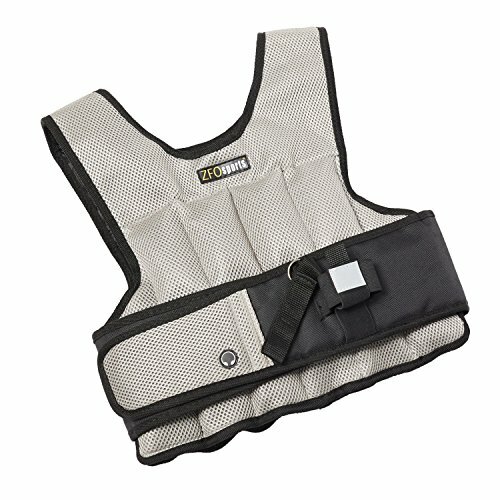 If you are looking for a high-quality and heavy-duty weighted vest, this can be a great option that you can invest in. Not only does it allow you to carry more than 100 pounds, you can also expect that this weighted vest is quite comfortable for its users. The Hyperwear Hyper Vest Pro is a choice for many professional athletes. Made of professional-grade material, this weighted vest is perfect for those who are looking to add intensity to their workouts regardless if it is running or you are doing some circuit training. It has been designed to be unisex as well making it a great addition to gyms that cater to both men and women. The design of the Hyperwear Hyper Vest Pro is very comfortable. It offers a full range of motion. Even if you are wearing it, you really won’t get bothered by it mainly because you can adjust the weighted vest with ease. 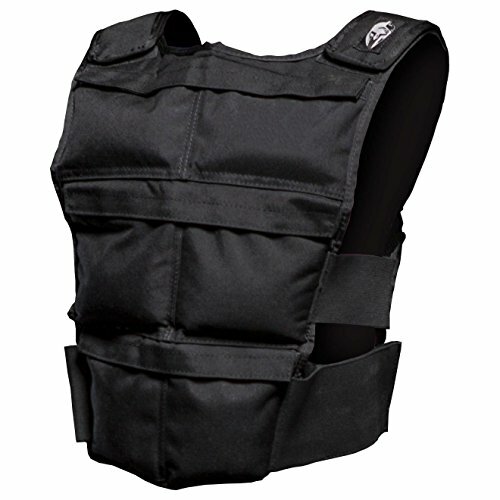 It also has a thin profile which makes even more comfortable than your average thick weighted vests. In terms of functionality, the Hyperwear Hyper Vest was designed for an athlete. It has an open side not only for adjustment but also for ventilation. It is also made of stretch fabric that even makes it perfect for those who are constantly doing their workout for a good amount of time. The build for this particular weighted vest is quite durable for its purpose. It can easily handle the weights that the vest is supposed to carry. However, it has only been designed for 10-pound weights. This means that if you are looking for more resistance on this particular vest, then this isn’t the product that you should be going for. If you are the type looking for a lightweight weighted vest, then this can be one of the best options out there. It has been designed with comfort in mind, not to mention it offers a full range of motion. If you are a beginner who is just looking for but something a weighted vest that is lightweight, SKLZ weighted vest is a good option that you can go for. It offers velcro that allows you to adjust according to your body’s contour and fit. And unlike other types of weighted vests that you use for running or workouts, the SKLZ Weighted Vest is compact. 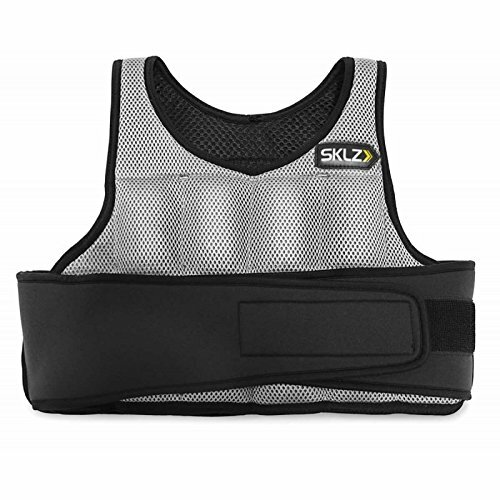 The SKLZ Weighted Vest has been designed with comfort in mind thanks to its ergonomic design. It allows the user to move around without any restriction. And for this reason, it only means that you can freely swing your arms while running or even use it while you are doing other activities such as pull-ups and other similar workouts. In terms of overall functionality, the SKLZ Weighted Vest is a great option that is snug to the body. It means that you can be sure that it stays with you for the entire duration of your workout. It is designed with equal weight distribution that can help minimize or get rid of muscle imbalance while you run. And also, you can convert the weighted vest as a sandbag for different workouts. The material on the SKLZ Weighted Vest weights is made of waterproof material that simply means you don’t have to worry if you run outside or if you are going to sweat too hard. This weighted vest can fit your needs. However, though the weights are well distributed and it is adjustable to your body’s form, it needs a bit of improvement on the velcro stitching. 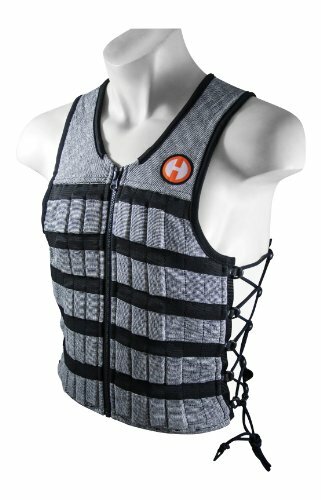 Run fast has created two types of weighted vests. There is the 12lbs to 80lbs model while there is also the 100 lbs to 140 lbs model. Both offer versatility especially for those who want to really put on weights on their running vest. This can be used not only for running but also for those who plan on doing CrossFit, pull-ups, and even dips. The thing that makes the RunFast weighted vest a great option is the fact that it is very comfortable to use. Regardless of your body type and your weight, this product can be used. It is also a great product that you can use for running and doing other types of workouts. It prevents chafing on your skin which is usually caused by friction. And since it is completely attached to your body, you can prevent this type of discomfort while using the RunFast weighted vest. Also, you can expect that it is easy to use. In fact, it is very user-friendly especially to those who used the weighted vest for the first time. In terms of functionality, you do have a choice when it comes to how much weight you want to place in your vest. You can add as much as 140 pounds in one of its model which is perfect for tall guys who love to use the product. Workmanship is also great when it comes to the RunFast weighted vest. The company lived up to its expectation considering that the RunFast weighted vest carries a tremendous amount of weight. You can see that the stitches were carefully made and the product has undergone tough scrutiny before it was sent out to the market. However, you have to consider the reality that there are some reviews saying that the product has given up on them just after two months of use. So it can be possible that their quality control is still not 100% reliable. The product is a great option for those who want to increase the intensity of their workout. It is also a great option for those who are planning to put on massive weight on their vest. You can have either the vest that has an 80-pound limit or the one that has a 140-pound limit. A lot of women find it difficult to have a weighted vest for them. It is typically made for men. And though many are marketed to be unisex, the female body has been designed differently. And for this reason, Empower Weighted Vest is the perfect option for women. Not only is this item perfect for those who are looking to increase the difficulty of their running routine, it can also be the perfect option for those who plan to do CrossFit. First, let us discuss comfort. Since it has been designed for women, the Empower Weighted Vest has an x-shape silhouette that has been made specifically for a woman’s figure. In addition to this, this 8-pound weighted vest adds resistance to women but is also not too heavy for an average woman’s workout. Though it is a bit lighter than most weighted vests in the market, you can still get the results that you are looking for as you can burn 12% more calories wearing the weighted vest. It is also a great weighted vest that you can use if you love running outdoors. It has reflective strips that ensure visibility even at night. Also, the waist size is quite adjustable. You can wear it if your waist is 24 inches to 48 inches. It also has adjustable straps that you can use in order to suit your body type. The build is quite durable. You can see that the pads added on the weighted vest were used in order to enhance overall comfort especially for runners who are working out for hours. And also, you can see that the stitches are well made. If you happened to be looking for a weighted vest that is fit for women, then this is the product that you should go for. It is made specifically for the female body. It is also adjustable allowing women of all sizes to enjoy this gear. Brute Force Weighted Vest is one of those weighted running vests made for rough usage. It is the weighted running vest that is used not only by runners but also by law enforcement and FBI. 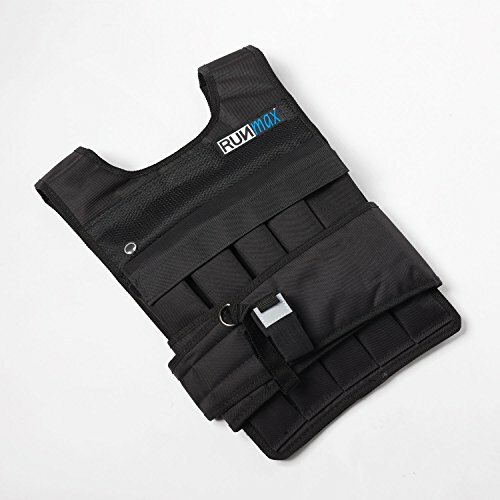 It helps get law enforcement officers get into condition considering that you can choose how much weight you want to add to this running vest. Brute Force Weighted Vest is possibly one of the best options for both men and women looking for weighted vests. This weighted running vest has been built with ergonomics in mind. Unlike other products, it has been backed by research ensuring that you can have complete mobility even if you are wearing the weighted suit. Basically, the fit is just perfect especially if you are around 170 pounds. 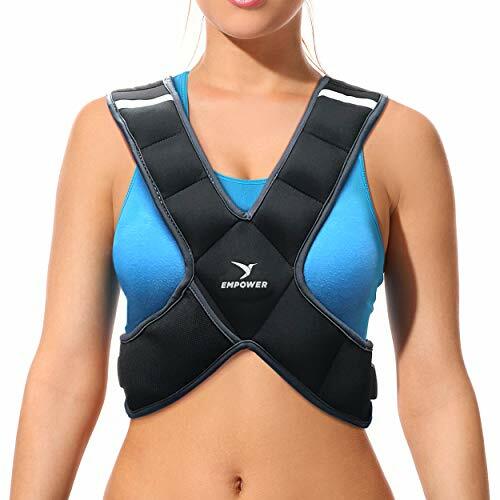 It has an adjustable weighted vest that can allow different users to feel comfortable as they use this product. You can use the product whether you want to carry heavy or you want to just add lighter weights on your vest. The Brute Force Weighted vest allows the weight to be adjusted whether you want no added weights or you want up to forty pounds. Brute Force Weighted Vest lives up to its name in terms of its overall durability. It has been made using only the best materials and is handmade. But unlike other products that have been outsourced to factories in China and other countries that don’t have a high level of craftsmanship, this product is made in the US. And as expected, there were no cutting corners when it comes to its manufacturing. Brute Force Weighted Vest is a great option for those who plan to invest in a weighted running vest that is adjustable and comfortable at the same time. Since it fits both men and women, this is also perfect for gyms and fitness centers as their clients can easily use it without any problem. Running can never be complete without your phone and a bottle of water to keep you hydrated. And technically, yes it also adds some weight. That’s what ZFOsports Weighted Vest is all about. It prioritizes comfort and ergonomics especially for those who are going to use their product for long durations of running. ZFOsports adjustable weighted vest is a great option if you are the type of runner who loves to stay hydrated. Of course, it can be a problem if you still have to bring a bottle of water as you struggle to run with your weighted vest. When using the ZFOsports adjustable weighted vest, you really don’t have to do much as it has a pocket that can hold your phone and your bottle of water. 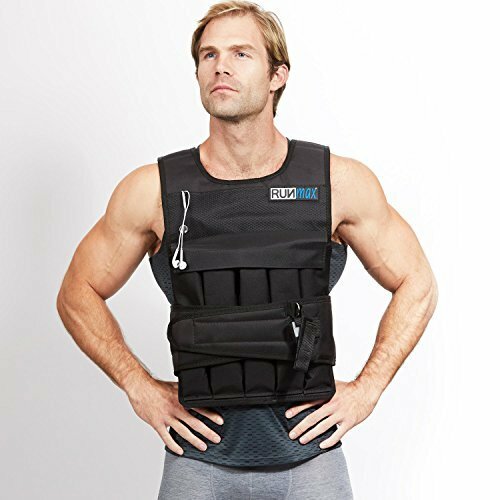 It is also highly functional as you can easily fasten the weighted vest on your torso. It is molded and fitted allowing you the vest to stay and eliminates shifting as you perform various activities regardless if it is running, walking, or even some plyometric workouts. It is also a favorite among gym goers considering that you have plenty of freedom on the arms but snug on the chest. This gives you the choice to even carry additional weights from kettlebells to dumbbells depending on your workout. The product is also built to last. It is made of top-notch materials. It makes use of high-quality fabric that can withstand the usual wear and tear in the gym. Its fabric is also something that is designed to absorb sweat. In terms of craftsmanship, ZFOsports adjustable weighted vest meets the standard of very particular fitness enthusiasts. ZFOsports Adjustable Weighted Vest is a decent product in the market. Not only does it offer you additional weight, it is also snug and is something that you want to use for your workouts. You also have freedom around the arm that gives you the option to even do kettlebells and dumbbell exercises. Improving your physical performance by using weighted vests can be a good thing. However, you have to pick the right one that suits your needs. Men and women have different needs especially if you consider the contour of the body. With these options, you will be able to pick the right one that specifically meets your needs as an athlete or someone who simply wants to stay fit.